Protests in Dakar earlier this year. via ROAPE. First published at Review of African Political Economy (ROAPE). For years Pascal Bianchini has been researching and writing on protest, activism, and the left in Senegal and Burkina Faso. He is widely recognized as an expert on student movements on the continent. Based in Dakar, he has undertaken important new research on the major events in Senegal in 1968, and the impact on the left in the years that followed. He sees the explosion of student and worker resistance that year as triggering the growth of radical left politics and organisations in the country and region. Ultimately, these movements led to a period of democratic transformation on the continent that overturned one-party states and dictatorships. Remi Adekoya: So how did your story with Senegal start? Pascal Bianchini: For me the story has been quite long, going back to the 1980s when I came here for my PhD fieldwork to investigate the social struggles within the school system as well as education policies connected with these struggles. Right now, I teach at a secondary school in Senegal and am still trying to gather information about the events of 1968 and their aftermath during the 1970s, which was a very interesting period of what we could describe as "revolutionary politics." Of course, there are challenges to gathering this kind of information, as these events happened fifty years ago and many of those who actually witnessed them might not always remember so clearly what exactly happened in which month, week etc. Also, many of the political pamphlets being distributed during these events have disappeared as people were afraid to keep them after the government crackdown started soon after the events in 1968. So, could you briefly recall for us the sequence of events that led to the mass strikes? A very important event before the 1968 strikes was the overthrow of Kwame Nkrumah in February 1966. This was a major incident in Dakar as well and students went to demonstrate in front of the American and British embassies who they blamed for the coup. Another major event that year in Senegal was the country’s hosting of the World Festival of Black Arts. These two combined events represented the moment when the student movement started to rebuild after being suppressed by president Léopold Senghor in the early 1960s. For instance, the Union générale des étudiants ouest-africains was banned in 1964, but in 1966, the government was forced to accept the existence of the Union des étudiants de Dakar and the Union démocratique des étudiants du Sénégal. They helped create an anti-imperialist atmosphere along, of course, with some other things going on outside Senegal such as the Vietnam War, the Portuguese colonial wars in Guinea Bissau and Angola and Mozambique etc. The spark for the actual events of 1968 was the government’s decision to cut scholarships for university students, some by half, some by one third. This got students angry and they started a strike on 18 May. They were quickly joined by secondary school pupils who attended the campus strike meetings. On 27 May, the students started an all-out strike, yet two days later Senegalese police raided the campus. It was very violent with many injured and one person killed. Hundreds of students were arrested and sent to a military camp in Ouakam, a small place near to Dakar. This was a shock for the country and workers quickly joined the movement in solidarity. The government responded by arresting trade unionists, who were sent to Dodji a military camp in the north of the country. 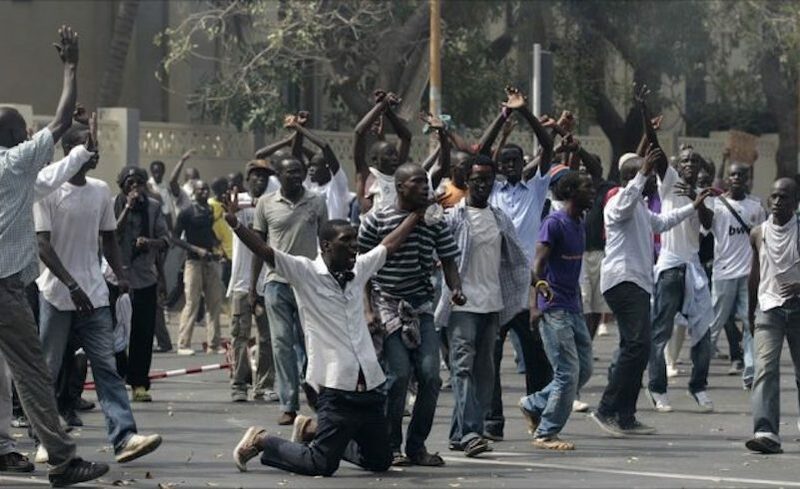 However, due to mass riots mainly in the capital city of Dakar, the government had to release the activists and start negotiations with them in June. Wages were increased and some other concessions made to reduce tensions. The same thing had to be done in September with the students — so the events of May 1968, in reality, spread across the rest of the year. In 1969, the following year, there was a virtual remake of the crisis, but the government was better prepared to deal with it and prevented the general strike from spreading. Yet, the main consequence of the 1968 events was that people saw that the regime of Léopold Senghor was not as strong as they had thought it was. Prior to that, Senghor had been able to suppress all opposition to his government and silence his rivals including through the arrest and imprisonment of Prime Minister Mamadou Dia in 1962. But in 1968, the whole country saw that his regime had been weakened and destabilized. This gave young revolutionaries in their twenties the hope and inspiration to commence what I would call the street-fighting years, which lasted from 1968 up to the mid-1970s. During this period, there was a lot of unrest and active opposition to a government considered by many to be neo-colonial. The radical left also believed Senghor’s government could be overthrown. However, Senghor was a shrewd politician and his regime eventually adapted to the situation. He was conscious about his image abroad and did not want to appear as a dictator. By 1974-75, he started to realize he needed a legal opposition. At first, he tried to limit the number of parties that could participate in the political system, and in effect choose his opponents. For instance, Abdoulaye Wade, who in elected President in 2000, was allowed to launch his Parti Démocratique Sénégalais in 1974. So, in the years 1974–75, the multi-party system was essentially limited to four parties, including one Marxist-Leninist party, the Parti africain de l’indépendance, whose "historical" leader Majhemout Diop was allowed to return from exile and to launch a "legal PAI," whereas most of the PAI members continued to operate in secrecy. The system started to open up and many groups challenged the limited nature of the multi-party framework. By the time Abdou Diouf succeeded Senghor in 1981 the country had abandon this limited multi-partyism and accept a full multi-party system, which at the time was not that common in Africa. We can see how an internal process, started in 1968 and driven by the left, led to major political changes in subsequent years. What is the condition of the left today in Senegal? It is in a state of confusion today unfortunately. One of the consequences of the multi-party system was that after one or two decades, various leftist movements and groups entered into alliances with neoliberal parties, with all the ideological consequences of that alliance. Many of them also suffered internal splits, not necessarily because of ideological disputes but over personal struggles for leadership. In this complex web of alliances and counter-alliances, it is difficult to grasp what actually remains of the left today. So, to be honest I am not so optimistic about the left today in Senegal. However, there is still a political culture of struggle that we could describe as a legacy of the 1968 years. The ideological atmosphere today is different, but that culture of social struggle is still very much alive, and the problems essentially remain the same. Just a few weeks ago, a student was killed by the police during a demonstration triggered by delays to payments of scholarships for students; the exact same issue which led to the 1968 events. In fact, because of the tensions on university campuses, the organizing committee — maybe thanks to some of its members who are close to the government — decided to postpone commemorative events for the 1968 strike till July, by which time they hope things will be calmer. So, we basically have an echo of the 1968 events, though, of course, in an entirely different ideological atmosphere. The reasons for the resistance remain but as I said, the situation is different. For instance, today various Islamic religious movements are active on Senegalese university campuses whereas student unions no longer exist in the same form. Also, as I mentioned earlier, since the 1990s many of the activists of the 1970s and 1980s have been or are now in government or close to government circles. Yet the fundamental issues that provoke opposition remain strikingly similar. For instance, there is the issue of a trade agreement between the EU and Senegal (and other African states) that will essentially see EU goods coming into Senegal without tariffs. There is strong opposition to that in Senegal and in other African countries where such moves are being considered. Also, there is the issue of the CFA currency, which is seen as a colonial currency. So, there are many anti-imperialist sentiments on the ground. Driving around the streets of Senegal, you can see painted slogans saying, "France get out" ("France dégage!") in reference to the many French companies and other French influences many people feel exist in their country. Recently, we have also witnessed the emergence of a movement called "Faidherbe Must Fall" similar to "Rhodes Must Fall" [Louis Léon César Faidherbe was a French colonial general and adminstrator, responsible for much brutality in Senegal] … Still, I would not describe today’s atmosphere as revolutionary, no. So, what is the future for the left in Senegal? For years there have been attempts to build a united left, but the reality is that in practice, you either accept the neo-colonial reality with heavy French influence or you stay away from government circles. There are still a few leftist groups with a clear political position, but they are in the minority. For now, the situation doesn’t look very promising but sadly, this is by no means peculiar to Senegal. However, the spirit of struggle and resistance lives on in the country. Pascal Bianchini is an independent scholar, researcher, and activist based in Senegal. He has written extensively on social movements, protest, class, and schooling in Africa. His groundbreaking book, Ecole et politique en Afrique noire is published by Karthala.